Today, we will be introducing a latest pachislot machine of a popular game series “Castlevania”. Its original work “Lords of Shadow” is the first game of the series to be developed in oversea production. 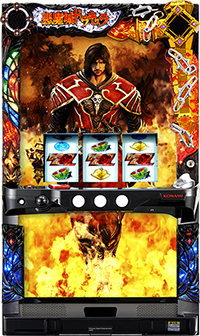 This latest pachislot machine is developed with the supervision of Kojima Productions who are known for their “Metal Gear Series”, it is truly a “Castlevania -Reborn-”. The word “Reborn” is a keyword to this machine that they have renewed all of the gaming features. The gaming feature of this new machine is quite challenging. It is expected to make its debut in July. Look forward to it.